And showed that she’s certainly tough enough for the long haul. Hillary Clinton speaks at a campaign rally on Thursday in San Diego. 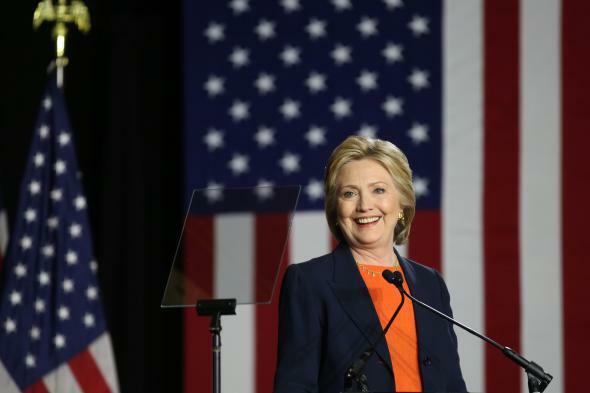 For those who thought Hillary Clinton needed proxies or a running mate to attack Donald Trump with the savagery required of a long-slog campaign, her Thursday speech in San Diego should be a mind-changer. The all-but-inevitable Democratic nominee showed that she’s fit to be her own attack dog, mauling her ill-matched Republican foe to shreds without getting muddy in the process. Donald Trump’s ideas aren’t just different; they are dangerously incoherent. They’re not even really ideas, just a series of bizarre rants, personal feuds, and outright lies. He is not just unprepared, he is temperamentally unfit to hold an office that requires knowledge, stability, and immense responsibility. This is not someone who should ever have the nuclear codes, because it’s not hard to imagine Donald Trump leading us into a war just because someone got under his very thin skin. The audience gasped at hearing “bizarre,” tittered at “personal feuds,” and burst into laughter and applause at “very thin skin.” They hadn’t heard any presidential candidate talk like this—they certainly hadn’t heard Clinton talk like this. It was a full takedown of Trump, but in an anti-Trump manner, spoken not in vague adolescent epithets (“stupid,” “idiotic,” “crooked,” “goofy”), but in an itemized checklist of his utter, almost laughable unsuitability for the job. Reciting her own experience as first lady, senator, and secretary of state (as she sometimes does with a bit too much self-indulgence, but it was completely fitting here), she said, “Every president makes hard choices every day with imperfect information and conflicting imperatives. … Making the right call takes a cool head and respect for the facts. … It also takes humility, knowing you don’t know everything, because if you’re convinced you’re always right, you’ll never ask the hard questions.” Recalling President Obama’s hard choices the night of the Osama Bin Laden raid, she said, elevating her voice a bit, “Imagine Donald Trump sitting in the Situation Room, making life-or-death decisions for the United States”—prompting the audience, by this time secure in her palm, to laugh and howl, “No-o-o-o-o-oo” in protest. She flung forth the entire litany of his shortcomings: his proposals to default on the national debt (treating the economy “like one of his casinos”), his pronouncement that he knows more about ISIS than the generals, his advocacy of torture and of murdering the relatives of suspected terrorists, his demonization of Muslims (“playing right into the hands of ISIS”), his dismissiveness toward America’s allies and their importance to U.S. security, his opposition to the Iran nuclear deal (“Donald Trump doesn’t know the first thing about Iran or its nuclear program—ask him; it will become very clear, very quickly”), his persistent mockery and nastiness (“He has no sense of what it takes to deal with multiple countries with competing interests and reaching a solution that everyone can get behind”), his paucity of ideas about how to solve the world’s real problems (“He doesn’t have a clue what he’s talking about”). On each point, she contrasted his flimsy prejudices not only with her own experience and thought-out views but also with the long-standing, bipartisan traditions of American diplomacy. This election suddenly got a little bit fun.